What’s a Family History Center Affiliate? [Note: As of October 3, 2017, changes have been made and affiliate centers have access to nearly everything a Family History Center has. However, there will still be some databases only available from a Family History Center.] 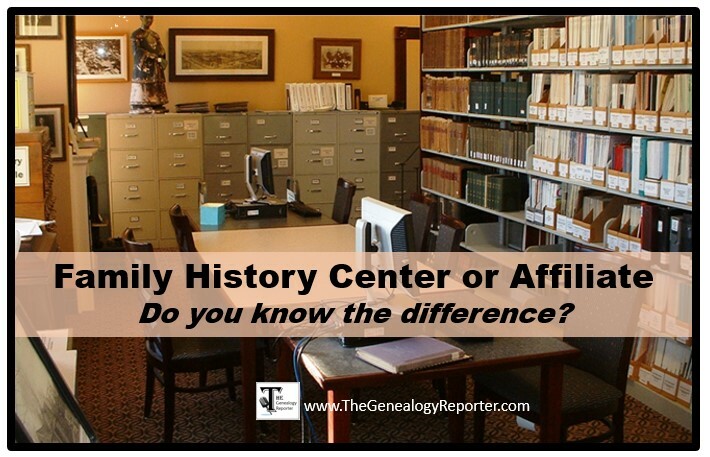 A Family History Center Affiliate is different than a Family History Center. With the discontinuation of microfilm distribution from the Family History Library of Salt Lake City, you need to know the difference. First, I cannot speak for FamilySearch or for The Church of Jesus Christ of Latter-day Saints. 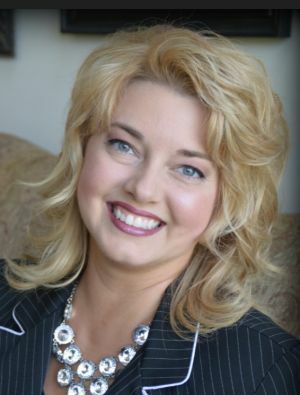 I am simply a fairly well informed professional genealogist who also happens to be an LDS member and past Family History Consultant and Assistant Director. Here’s what I know: FamilySearch has made an official announcement “to discontinue its 80-year-old microfilm distribution service.” Because of significant progress made in the digitizing of microfilm, as of 31 August 2017, we will no longer be able to order microfilm from the Family History Library in Salt Lake City and have it sent to our local Family History Centers. Other times, you would be logged in, but the system would say you still didn’t have access to view those records. That may be because you are not a member of the Church. When an LDS member creates a FamilySearch account, it is attached to our record number. The system then knows the person looking at that record is LDS. LDS individuals have special access to many items because FamilySearch has negotiated with other companies/groups for that access in exchange for something. Like maybe FamilySearch will share with Ancestry.com their Virginia Marriage Records if Ancestry is willing to share with members of the Church their Ohio death records. (This is just a made up example!) Now, we might refer to this as having “Level Two” access. Level Two access is for LDS members who are logged into FamilySearch. There is now going to be what I am calling “Level Three” access. That level means that even though I am logged into FamilySearch AND I am LDS, there will be some digitized records I can only access from a Family History Center. And that’s where it gets confusing. In this image below, you will see I can’t access the Virginia Marriage’s I want to see. It tells me that I must go to a Family History Center. In the past (and up until 1 Sept 2017), I could order the microfilm from the Family History Library in Salt Lake City, Utah, via FamilySearch and have it sent to my local Family History Center or Affiliate. The microfilm would be sent to that place and I could access or look at it there. I could also choose to simply go to my nearest Family History Center and see the digital images via their Family History Portal. I typically chose to order the microfilm and have it sent to the affiliate center because it is just 15 minutes from my home. My closest full Family History Center is about an hour drive. With this new change to the microfilm distribution, as of 1 September 2017, I will no longer be able to order the microfilm. My only option will be to go to the nearest Family History Center to view the images. 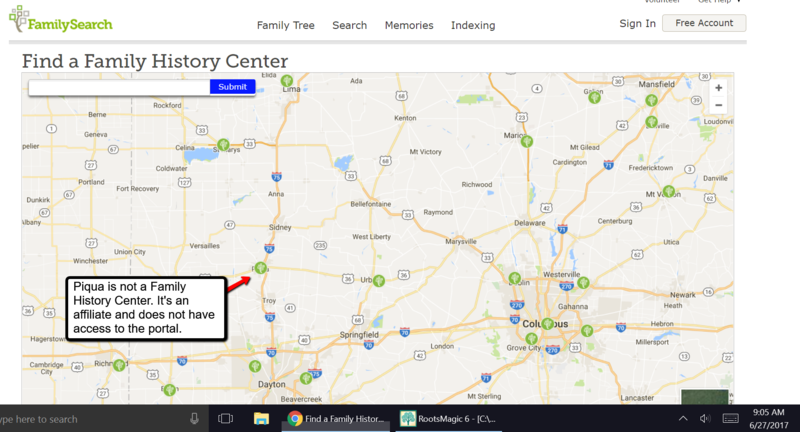 If a person in my area were to see this notification and click the “family history center” hyperlink, they would see the Piqua Public Library is a Family History Center and very nearby. However, that is deceiving because the Piqua Public Library is an affiliate center and does not have access to the Family History Portal. The center you choose to visit must have access to the portal to see the images of these Virginia Marriages. What’s the Family History Portal? The family history portal is kinda like a intranet instead of internet. In other words, only persons/groups with certain access can see this portal and access the material that is in it. It is connected to the Family History Library in Salt Lake City. A Family History Center that is housed in an LDS Ward or Stake building typically has access to this portal. But affiliates, do not, to my knowledge. Will affiliate centers have the opportunity to become full fledged Family History Centers with access to this portal? I doubt it, but I don’t know. We will have to see. In the meantime, order the microfilm you need soon. Make time to view that microfilm before 1 September, because you never know when or if that microfilm will be sent back to the Family History Library in Salt Lake City. It will be up to local leaders of the Church, libraries, and the Family History Library as to when or if this happens. Also, find out where your closest Family History Center is WITH ACCESS TO A PORTAL. You can do that by clicking here. Find a location near you and then be sure to call them and ask if they have the portal. Also, double check their hours of operation. Sadly, many Family History Centers are run by volunteer church members and are unable to keep a large enough staff to be open more than one or two times a week. Learn how to find digitized records online at FamilySearch with this helpful tutorial. Be sure to subscribe to our YouTube channel so you won’t miss a thing! Great to know, Allan! Thanks! I was disappointed to discover the D.C. library I was searching in was an affiliate without access to the records I couldn’t view at home. Sadly, the FHC libraries are not centrally located in this area. An adjustment for sure. Thanks for highlighting this issue, Amie. Michael..I am sorry to hear that, too. Be sure to order any microfilm you need before August 31st and have it sent to the affiliate. In my recent post, I mentioned that you will get the extended loan for the price of the standard $7.50. Extended loans mean that the film will stay at your affiliate “indefinitely.” That means until the powers that be decide it is not being used frequently enough, the films become accessible online, or the affiliate closes. Might tide you over for the next few years! Wishing you the best! Yes Bonnie, that is true. They have made some major changes and affiliate libraries will now be able to have access to “almost” everything!